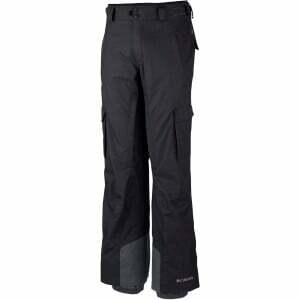 The Columbia Men's Ridge 2 Run II Pants love snowy winter weather. The waterproof breathable Omni-Tech membrane and fully taped seams mean you stay dry throughout all the winter storms. Omni-Heat thermal reflective lining integrates tiny silver specks along the pant's interior to retain warmth after the sun sets without adding any bulk to these pants. Articulated knees let you duck, bend, and cruise all over the ski resort with the freedom of movement you require, a modern classic fit leaves plenty of room for layers galore on seriously chilly ski days, and vented zippers in the legs let out some steam in case you get too hot. Internal leg gaiters keeps snow off your boots, and Columbia reinforced the cuff guards to increase durability and longevity. Stash your snacks in the cargo pockets.